Registration accepted for children who are 4 years old on or before March 1 for the upcoming school year. 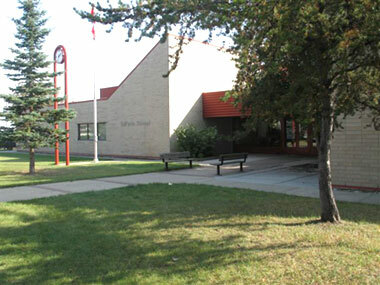 ‌Students can participate in extra-curricular activities such as floor hockey intramurals, Track Club, Art Club, Garden Club/Naturescape and various special interest clubs. At LaPerle School our ultimate goal is to have every student achieve at least one year’s growth in relation to the curriculum standard each year. In previous years most of our students did achieve one or more years growth in reading and writing. To do this we place a strong emphasis in the areas of literacy and numeracy, specifically to engage students in learning through 21st Century Literacies across the curriculum. In the latter part of the last century, the Canadian Government encouraged colonists to settle in the west. Reverend Father Morin, a colonizer from eastern Canada, brought many families to the west. Among these was the Felix LaPerle family. The family, with their five children, arrived in Edmonton in 1898. They traveled on the Canadian Pacific Railway from Cornwall, Ontario to Strathcona, Alberta, which was the end of the railroad. From there they took the ferry across the North Saskatchewan River and continued the journey west by horse and wagon to what would later be called Winterburn. Here they bought a quarter section of land from the Canadian Pacific Railway for $427.00. By 1906, a small store had been built to serve the community. Later a post office was opened in the store. In 1929, Leo, one of Felix’ sons, and Annie LaPerle bought the store and expanded it. They operated it for the next forty years. The store soon became a centre for the Winterburn community. People were welcome at all times both in the store and their home. During the Depression, lonely people from a nearby work camp would walk to the store to listen to the radio on Saturday or Sunday and would often stay all night. 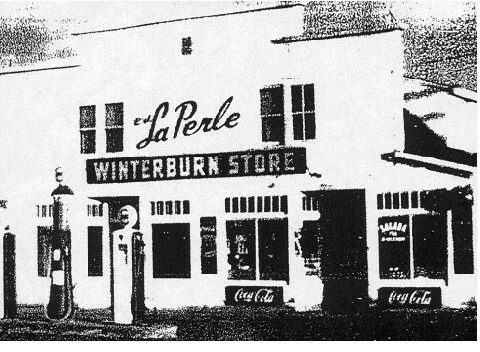 LaPerle’s Winterburn Store was also a destination and landmark for “the city folk” going for a Sunday drive or a long bicycle ride. The store marked the “end of the gravel”, and it was a good place to buy a cold drink. Although the store was demolished in 1969 to make way for the Winterburn overpass on highway 16A, it is fondly remembered by Edmontonians. How appropriate that LaPerle School was opened to help perpetuate the name of a pioneer family whose service to this community was exemplified by dedication, trust and true friendliness. We are responsible for the collective success of our children and children are at the heart of our decision making.